Every year in mid-August, Earth plows headlong into the debris left behind by Comet 109P/Swift-Tuttle. Slamming into our atmosphere at 130,000 mph, the crumbles flash to light as the Perseid meteor shower. One of the world’s most beloved cosmic spectacles, this year’s show promises to be a real crowd pleaser. Not only will the Moon be absent, but the shower maximum happens around 3 a.m. CDT (8 UT) August 13 — early morning hours across North America when the Perseid radiant is highest. How many meteors will you see? Somewhere in the neighborhood of 50-100 meteors per hour. As always, the darker and less light polluted your observing site, the more zips and zaps you’ll see. Find a place where there’s as few stray lights as possible, the better to allow your eyes to dark-adapt. Comfort is also key. Meteor showers are best enjoyed in a reclining position with as little neck craning as possible. Lie back on a folding lawn chair with your favorite pillow and bring a blanket to stay warm. August nights can bring chill and dew; a light coat and hat will make your that much more comfortable especially if you’re out for an hour or more. I’m always asked what’s the best direction to face. Shower meteors will show up in every corner of the sky, but can all be traced backwards to a point in Perseus called the radiant. That’s the direction from which they all appear to stream out of like bats flying out of a cave. Another way to picture the radiant it is to imagine driving through a snowstorm at night. As you accelerate, you’ll notice that the flakes appear to radiate from a point directly in front of you, while the snow off to the sides streams away in long trails. If you’re driving at a moderate rate of speed, the snow flies past on nearly parallel paths that appear to focus in the distance the same way parallel railroad tracks converge. Now replace your car with the moving Earth and comet debris for snow and you’ve got a radiant and a meteor shower. With two caveats. We’re traveling at 18 1/2 miles per second and our “windshield”, the atmosphere, is more porous. Snow bounces off a car windshield, but when a bit of cosmic debris strikes the atmosphere, it vaporizes in a flash. We often think friction causes the glow of meteors, but they’re heated more by ram pressure. The incoming bit of ice or rock rapidly compresses and heats the air in front of it, which causes the particle to vaporize around 3,000°F (1,650°C). The meteor or bright streak we see is really a hollow “tube” of glowing or ionized air molecules created by the tiny rock as its energy of motion is transferred to the surrounding air molecules. Just as quickly, the molecules return to their rest state and release that energy as a spear of light we call a meteor. Speaking of size, most meteor shower particles range in size from a small pebble to beach sand and generally weigh less than 1-2 grams or about what a paperclip weighs. Larger chunks light up as fireballs that shine as bright as Venus or better. Because of their swiftness, Perseids are generally white and often leave chalk-like trails called trains in their wakes. This year’s shower is special in another way. According to Sky and Telescope magazine, meteor stream modeler Jeremie Vaubaillon predicts a bump in the number of Perseids around 1:39 p.m. (18:39 UT) as Earth encounters a debris trail shed by the Comet Swift-Tuttle back in 1862. The time favors observers in Asia where the sky will be dark. It should be interesting to see if the prediction holds. Already the shower’s active. Go out any night through about the 15th and you’ll see at least at least a handful of Perseids an hour. At nightfall on the peak night of August 12-13, you may see only 20-30 meteors an hour because the radiant is still low in the sky. But these early hours give us the opportunity to catch an earthgrazer — a long, very slow-moving meteor that skims the atmosphere at a shallow angle, crossing half the sky or more before finally fading out. I’ve only seen one good earthgrazer in my earthly tenure, but I’ll never forget the sight. Ambling from low in the northeastern sky all the way past the southern meridian, it remained visible long enough to catch it in my telescope AND set up a camera and capture at least part of its trail! The later you stay up, the higher the radiant rises and the more meteors you’ll see. Peak activity of 50-100 meteors per hour will occur between about 2-4 a.m. No need to stare at the radiant to see meteors. You can look directly up at the darkest part of the sky or face east or southeast and look halfway up if you like. You’re going to see meteors everywhere. Some will arrive as singles, others in short burst of 2, 3, 4 or more. I like to face southeast with the radiant off to one side. That way I can see a mix of short-trailed meteors from near the radiant and longer, graceful streaks further away just like the snow photo shows. If there’s a lull in activity, don’t think it’s over. Meteor showers have strange rhythms of their own. Five minutes of nothing can be followed by multiple hits or even a fireball. Get into the feel of the shower as you sense spaceship Earth speeding through the comet’s dusty orbit. Embrace the chill of the August night under the starry vacuum. Wouldn’t it be nice if a meteor shower peaked on a weekend instead of 3 a.m. Monday morning? Maybe even showed good activity in the evening hours, so we could get our fill and still get to bed at a decent hour. Wait a minute – this year’s Geminids will do exactly that! What’s more, since the return of this rich and reliable annual meteor shower occurs around 6 a.m. (CST) on Sunday December 14th, both Saturday and Sunday nights will be equally good for meteor watching. After the Perseids took a battering from the Moon last August, the Geminids will provide the best meteor display of 2014. They do anyway! The shower’s been strengthening in recent years and now surpasses every major shower of the year. The official literature touts a rate of 120 meteors per hour visible from a dark sky site, but I’ve found 60-80 per hour a more realistic expectation. Either way, what’s to complain? The third quarter Moon rises around midnight Saturday and 1 a.m. on Monday morning. Normally, moonlight would be cause for concern, but unlike many meteor showers the Geminids put on a decent show before midnight. The radiant, the location in the sky from which the meteors will appear to stream, will be well up in the east by 9:30 p.m. local time. That’s a good 2-3 hours of meteor awesomeness before moonrise. The author takes in this year’s moon-drenched Perseids in comfort. Shower watching is a total blast because it’s so simple. Your only task is to dress warmly and get comfortable in a reclining chair aware from the unholy glare of unshielded lighting. The rest is looking up. Geminid meteors will flash anywhere in the sky, so picking a direction to watch the shower isn’t critical. I usually face east or southeast for the bonus view of Orion lumbering up from the horizon. Bring your camera, too. I use a moderately wide angle lens (24-35mm) at f/2.8 (widest setting), set my ISO to 800 or 1600 and make 30-second exposures. The more photos you take, the better chance of capturing a meteor. You can also automate the process by hooking up a relatively inexpensive intervalometer to your camera and have it take the pictures for you. As you ease back and let the night pass, you’ll see other meteors unrelated to the shower, too. Called sporadics, they trickle in at the rate of 2-5 an hour. You can always tell a Geminid from an interloper because its path traces back to the radiant. Sporadics drop down from any direction. Geminid meteors immolate in Earth’s atmosphere at a moderate speed compared to some showers – 22 miles per second (35 km/sec) – and often flare brightly. Green, red, blue, white and yellow colors have been recorded, making the shower one of the more colorful. Most interesting, the meteoroid stream appears to be sorted according to size with faint, telescopic meteors maxing out a day before the naked eye peak. Larger particles continue to produce unusually bright meteors up to a few days after maximum. Most meteor showers are the offspring of comets. Dust liberated from vaporizing ice gets pushed back by the pressure of sunlight to form a tail and fans out over the comet’s orbital path. When Earth’s orbit intersects a ribbon of this debris, sand and gravel-sized bits of rock crash into our atmosphere at high speed and burn up in multiple flashes of meteoric light. But the Geminids are a peculiar lot. Every year in mid-December, Earth crosses not a comet’s path but that of 3200 Phaethon (FAY-eh-thon), a 3.2 mile diameter (5.1 km) asteroid. Phaethon’s elongated orbit brings it scorchingly close (13 million miles) to the Sun every 1.4 years. Normally a quiet, well-behaved asteroid, Phaethon brightened by a factor of two and was caught spewing jets of dust when nearest the Sun in 2009, 2010 and 2012. Apparently the intense heat solar heating either fractured the surface or heated rocks to the point of desiccation, creating enough dust to form temporary tails like a comet. While it looks like an asteroid most of the time, Phaethon may really be a comet that’s still occasionally active. Periodic eruptions provide the fuel for the annual December show. Most of us will head out Saturday or Sunday night and take in the shower for pure enjoyment, but if you’d like to share your observations and contribute a bit of knowledge to our understanding of the Geminids, consider reporting your meteor sightings to the International Meteor Organization. Here’s the link to get started. And this just in … Italian astronomer Gianluca Masi will webcast the shower starting at 8 p.m. CST December 13th (2 a.m. UT Dec. 14) on his Virtual Telescope Project site. With the southern Delta Aquarid meteor shower peaking tomorrow morning, the summer meteor-watching season officially begins. While not a rich shower from mid-northern latitudes, pleasant weather and a chance to see the flaming remains of a comet seem motivation enough to go out for a look. With a rate 10-15 per meteors an hour you’re bound to catch a few. The farther south you live, the better it gets. Observers in the southern hemisphere can expect double that number because the shower’s radiant will be much higher in the sky. Any meteors flashing south of the radiant won’t get cut off by the southern horizon like they do further north. The annual shower gets its name from Delta Aquarii, a dim star in the dim zodiac constellation Aquarius. You don’t need to know the constellations to enjoy the show, but if you know the general direction of the radiant you’ll be able to tell shower members from the nightly sprinkle of random meteors called sporadics. If you can trace the path of a meteor backward toward Aquarius, chances are it’s an Aquarid. There are actually two meteor showers in Aquarius active this time of year – the northern and southern Delta Aquarids. The northern version sprinkles fewer meteors and peaks in mid-August. The Southern Deltas peak over the next two mornings – July 29 and 30 – but will be out all week. Both serve as a warm-up for the upcoming Perseid meteor shower that climaxes on August 12. Tonight’s shower will suffer no interference from moonlight, making for ideal meteor watching. Unfortunately, Perseid rates will be reduced by a bright waning gibbous moon. Don’t be surprised if you see a few Perseids anyway. The shower’s just becoming active. If you can draw a meteor’s trail back to the northeastern sky, it just might be a member. Read more about Perseid prospects from our own David Dickinson. Nearly all meteor showers originate from clouds of sand to seed-sized bits of debris spewed by vaporizing comet ice as they swing near the sun. 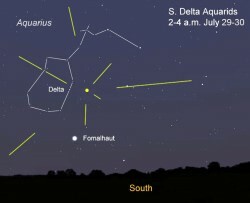 The Delta Aquarids may trace its origin to dust boiled off Comet 96P/Machholz. The best time to watch the shower is in the early morning hours before dawn when the radiant rises in the south-southeastern sky above the bright star Fomalhaut. Try to get away from city lights. Point your lawn chair south and spend some time in heavenly contemplation as you wait for Aquarius to toss a few javelins of light your way.